From Havana, Cuba, to New York, North America, as if collaborating with the walls of historical cities full of the memories of the people who live there, JR and Jose Parla fascinate us in their own way. 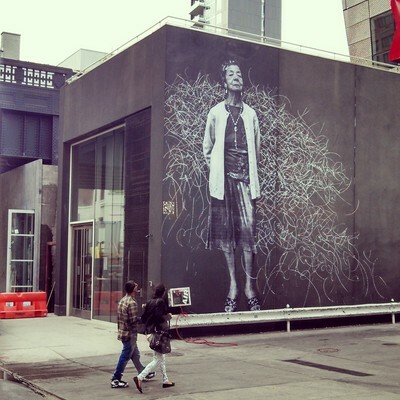 The exhibition by two artists, JR and Jose Parla, “Wrinkle of the City, Havana, Cuba ” is being held at Bryce Wolkowitz Gallery in New York City. 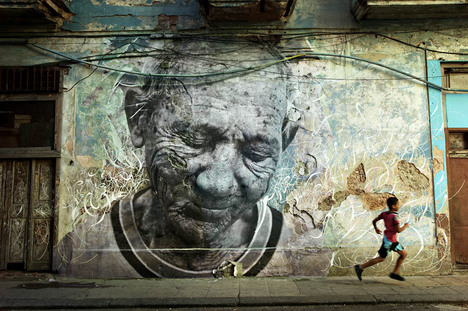 This features the series, “The Wrinkle of the City” by French artist JR, and uses pictures of the works made during the Havana Biennial of 2012 to reconstruct that time. In “The Wrinkle of the City” series, JR makes gigantic portraits of the people, bigger than a house, and puts them on places like a local city wall, on top of a roof or on stairs. He is active all over the world now – so far in Catrtagena, Spain, Shanghai and Los Angeles. Though he is a half-anonymous artist who is always wearing glasses, in 2011 he was awarded a TED prize which goes to those with a cultural idea that has the potential to change this world in good way- Bill Clinton and Bono of U2 were awarded in the past. He is one of the most promising artists of this era. 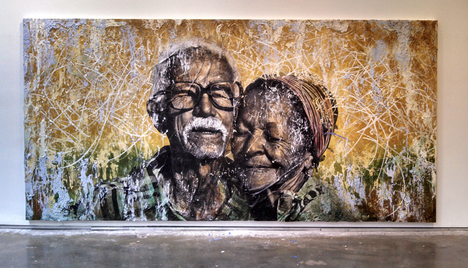 The other artist, Jose Parla, is an artist born in Miami, and based in New York City, and whose parents defected from Cuba to United States. He was a member of the artist collective Barnstomers in New York City, and his painting is abstract with sweeping lines influenced by graffiti. He has an innovative style which defies the established format. His painting is inspired from the walls of the city and has a one of a kind characteristic that intends to move across the border from street art into the gallery. Observing their collaboration shows matches in both style and message. The collaboration in Havana between these artists shows a sense of street art in both, and may have happened naturally. In the “The Wrinkle of the City” series, JR always uses some historical background as a motif highlighting a local place there. In “The Wrinkle of the City, Havana, Cuba,” he interviewed senior citizens who survived the Cuban revolution, and made works from their portraits. “The Wrinkle of the City” series can be seen as having a role to re-examine and make an improvement on the social issues and race issues all around the world. Though his art expression is dealing with a socially and historically heavy topic, his approach towards them is very modern and stylish and that must be one of the reasons why his works are widely popular. Except for “The Wrinkle of the City” series, JR takes photographs of the woman who have suffered from war and poverty in Brazil, India, Cambodia and Africa in the “Women are Heroes” series. In “Face to Face,” he deals with issues of Israel and Palestine. In each series, he put gigantic portraits on the walls of the city as if he used the walls as a canvas, and collaborated with them. The size of the picture is sometimes taller than a 10-story building for just one portrait. That scale is not featured in “The Wrinkle of the City, Havana, Cuba,” but it from the documentary of their work shown in one room of the gallery, it seems like very hard to work to put a large photograph on the wall of the city. The exhibition in Bryce Wolkowitz Gallery is a reconstruction of the works they made in Havana, and the essence of the collaboration this time must be in Havana not in New York, but still shows fulfilling works, and we can feel the air of Havana at the beginning of the summer through the photographs. Aside from photographs, there is one wall that features a reconstruction of the work they made in Havana, and the outside wall of the gallery, just beside the gas station, there is also one big wall work they collaborated on. We can see the emphasis on balance between the works and the environment around their works, aiming to present them as a total art expression including that environment. 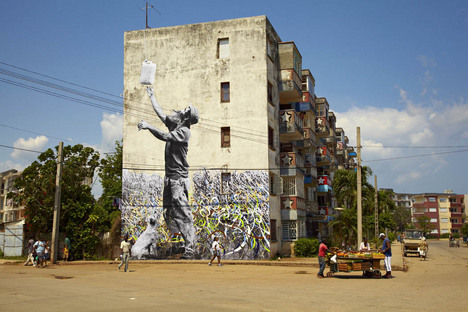 Looking at the photographs of the collaboration of the gigantic portrait of JR and painting by Jose Parla surrounded by the city environment makes us feel like we can hear the street noise of Havana. The gigantic portrait poster of anonymous citizens is opposite of commercial messages and political advertisements. Pasting such a personal image in the city can be antithesis to such propaganda. It is an illegal activity at the social end, but such an impossible thing is happening in his art expression across the world. JR was awarded the TED prize by advocating to “Use art to turn the world inside out.” His evolutionary art activity is in progress everyday somewhere in this world. 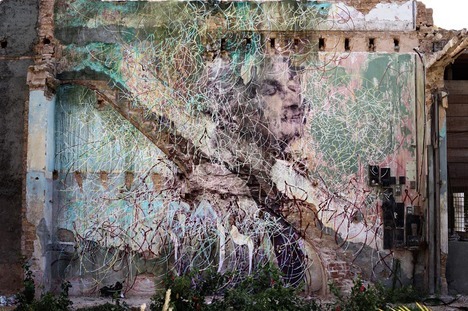 This collaboration between JR and New York based artist Jose Parla, who is of Cuban descent, shows the streets of Havana that contain history and the energy of modern society. “The Wrinkle of the City, Havana, Cuba” is held in Bryce Wolkowitz Gallery until July 12.